CAPACITY - 50 GMS. - 250 GMS. R & D Model Automatic Coating Systems for coating of various batch capacities of pharmaceutical tablets have been manufactured by NEOMACHINE for a long time. However, during the last few years due to changing scenario, some of the API being very costly making formulation development work also becoming more and more costlier which in turn are affecting the formulation development in a cost effective way. Keeping this in mind, Neomachine have now developed an unique R & D Model having smallest batch capacity of only 50 GRAMS which will be very helpful for formulation development work in laboratories. 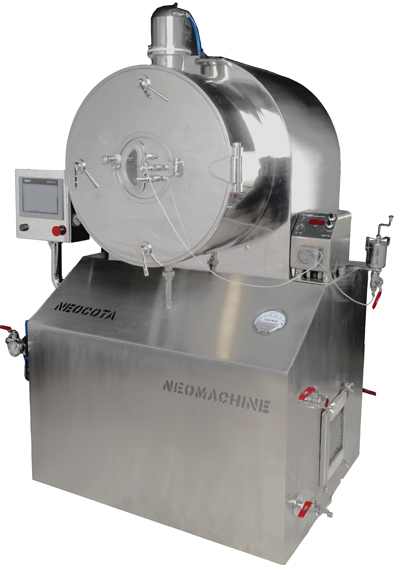 This Model which is called NEOCOTA MINIMAX is identical in design and construction to the higher capacity R&D machines and even the machines used for commercial scale production so that the scale up to the pilot plant batch and subsequently to commercial scale can be easily done. We hope that this particular Model will find wide acceptance to the formulation development scientists in this country and also globally. 1. Approximate Working Capacities (Depending on Tablet shape and Powder density) 50 gms. to 100 gms. & 150 gms. to 250 gms. 8. Exhaust Fan Flow Rate 75 CFM at 75 mm of W.C.
15. Power consumption 3 KW.